The first choice for Minibus hire in Kettering, Wellingborough, Rushden, Northampton and surrounding areas. Roys Minibuses are known throughout the area for our reliable and prompt service, the friendly and professional attitudes of our drivers, and our well kept comfortable transport. 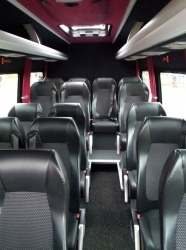 We are a family run business offering minibus hire in Kettering and provide transport throughout Northamptonshire, the surrounding areas and to the wider UK at large. We will transport you to all areas of the UK. Whatever your desire, whether short or long distance, we are here to deliver you safely and on time. The services of Roy's Minibuses are open to all members of the general public. We can cover corporate events, theatre, stag and hen nights, special events, parties, airport transfers in Kettering and all across the UK whatever time of day or night we are here for you. Competitive rates offered! We welcome a variety of contract work! We are the premier company to call for minibus hire in Kettering, mini coaches and airport transfers in Kettering. For more information please do not hesitate to get in touch with us using the details provided: TEL: 01933 680557 (local rate) today for more information on our range of services.